Cambridge University dominated the 74th Women’s Boat Race in a five-length margin of triumph to spectacularly mark coach Rob Weber’s first edition as chief of the Light Blue program. Cambridge, pre-race favourites, were always tipped to retain a title that has almost become customary in the past few years but the manner in which they ruthlessly dispatched their opponents paid strong tribute to the strength of their program and left Andy Nelder’s girls to lick their wounds and return to the drawing board for a third year in a row. Oxford, coxed by returning Blue Eleanor Shearer, stole the early impetus, driving a couple of seats out of their Light Blue counter-parts as the two crews surged away from the struts of Putney Bridge. Some thirty strokes in, both boats had settled into their rhythm and Cambridge, much fancied with substantial International pedigree on-board, had begun to assert their claim by taking the lead. As the first corner of the course unwound, a bend which the Dark Blues had a technical advantage through, Cambridge continued to stretch out and had almost settled into a length’s lead. As was obvious in 2018, both crews were exceptionally well drilled and despite the impressive early work of Cambridge, Oxford looked sharp and relaxed into a light breeze. Rowing, however, is a careful combination of technique and power and it was the Light Blues who clearly had the upper hand in the latter category, as they continued to turn the screw passing the Mile Post. From an Oxford perspective, the race had become desperate – they could no longer see or hear their opponents and the lonely isolation of a sizeable deficit is something that few crews have the fitness, technicality or spirit to overcome. Shooting the second lamppost under Hammersmith Bridge, the crews had swapped stations and Cambridge continued to press on into what was now a three length lead. Steered by former Westminster schoolboy Hugh Spaughton, the Light Blues were the epitome of composure – long and dynamic with plenty of engine capacity to call upon should Oxford mount a mid-race assault. The Dark Blues, meanwhile, looked tidy and technically adept but without the horsepower that drove their opponents forward into a grey London afternoon. 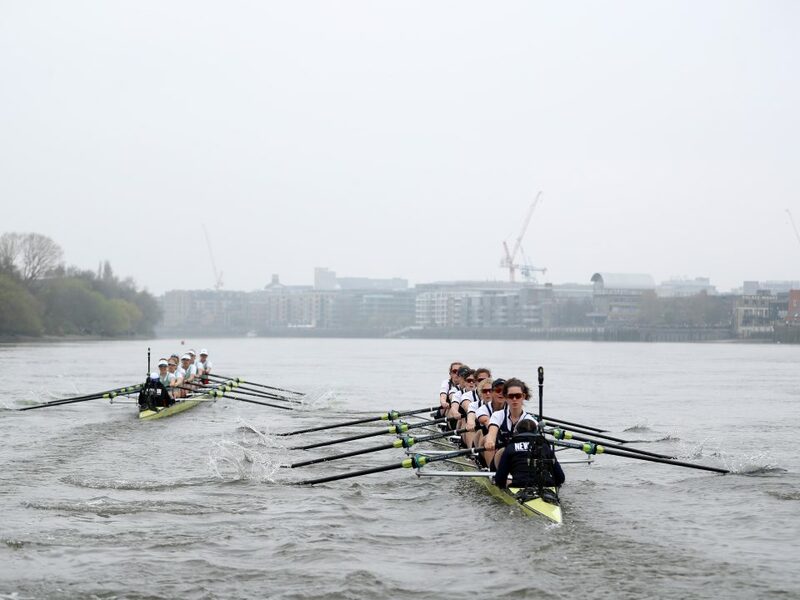 Cambridge reached Chiswick Steps in 11:29, three seconds behind the record set by their predecessors in 2017, and looked good as the second half of the race wore on. Previous editions of this iconic contest have often played host to every weather condition the UK has to offer but in 2019, the wind was calm, the river flat and the skies grey but dry on the first Sunday in April. Cambridge, undeterred by what was rapidly becoming a margin of comfort, showed Oxford little mercy as they stretched their advantage approaching Barnes Bridge. Crossing the line, Cambridge finished five lengths clear of Oxford in 18:47 to claim their third Boat Race title in a row.